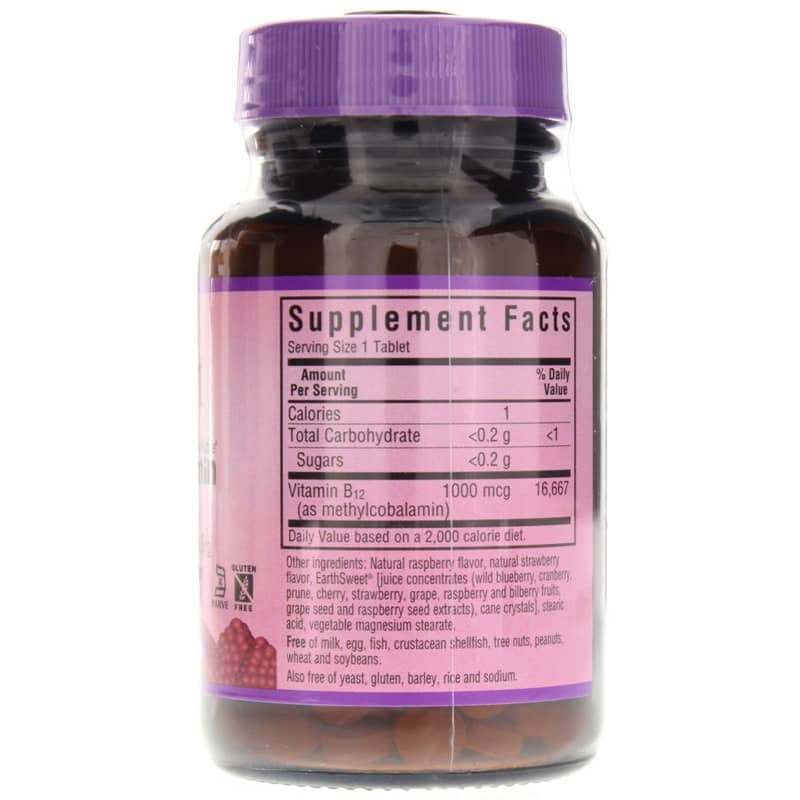 Earth Sweet Methylcobalamin 1000mcg is a chewable dietary supplement provides the coenzyme form of vitamin B12 to support healthy red blood cell formation and nerve health. Vitamin B12 is an important part of the B vitamin family, and plays vital roles in helping you maintain an optimal level of health and wellness. B12 can be gotten from foods like fish, meat, eggs, and milk, but is also available in supplement forms for everyday use. 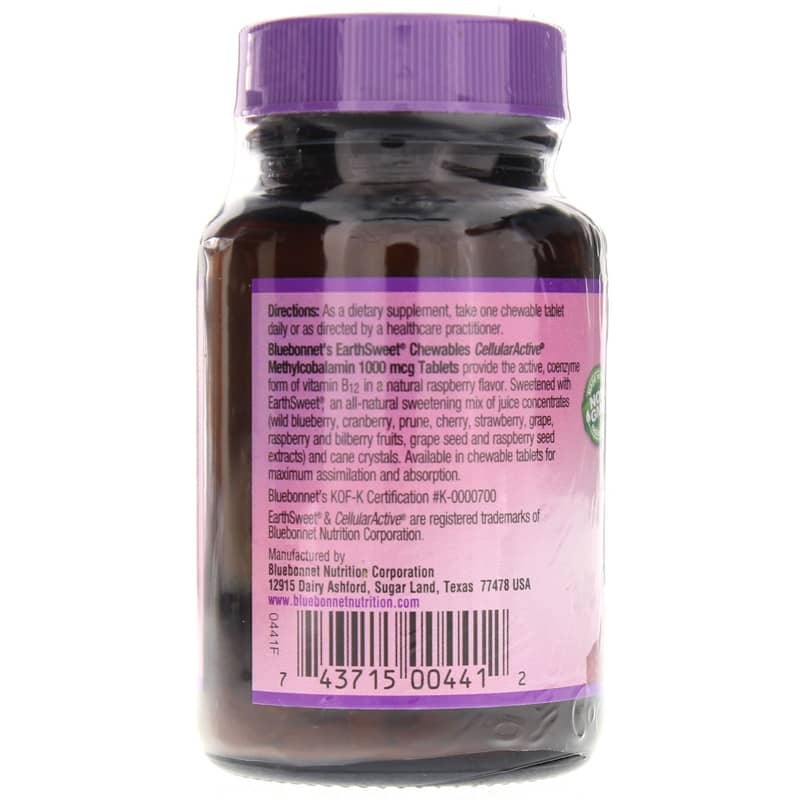 Earth Sweet Methylcobalamin 1000mcg from Bluebonnet provides an easy and great-tasting way to ensure you're getting your vitamin B12 every day. 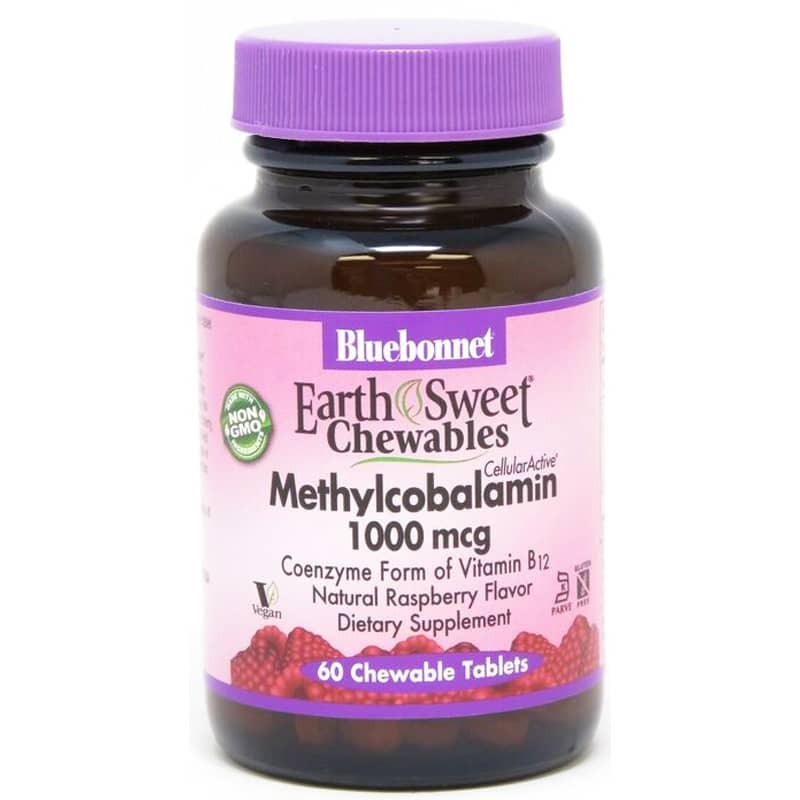 Bluebonnet's Earth Sweet Methylcobalamin 1000mcg does not contain any milk, egg, fish, shellfish, tree nuts, peanuts, wheat, soybeans, yeast, gluten, barley, rice or sodium. It is 100% GMO-free and Certified Vegan and Kosher. The easily chewable wafer form provides an alternative to tablets or capsules that may be difficult to swallow. Plus, the natural raspberry flavor tastes great. Order yours today! Other Ingredients: Natural raspberry flavor, natural strawberry flavor, EarthSweet [juice concentrates (wild blueberry, cranberry, prune, cherry, strawberry, grape, raspberry and bilberry fruits, grape seed and raspberry seed extracts), cane crystals], stearic acid, vegetable magnesium stearate. Contains NO: milk, egg, fish, crustacean shellfish, tree nuts, peanuts, wheat and soybeans. Also free of yeast, gluten, barley, rice and sodium. Kosher. Vegan. Non-GMO.